The underperforming hero shooter Battleborn will go free-to-play within the couple of months, a person familiar with plans for the game told Kotaku. Word is the announcement will come by mid-November, but that could change. (We hear the move has already been delayed a couple of times.) The source, speaking under condition of anonymity, said that developer Gearbox had wanted to make Battleborn free-to-play from the get-go, but publisher 2K preferred to sell it as a standard $US60 ($78) retail product. However, the game flopped, in part thanks to a glut of hero shooters like Blizzard's Overwatch, which launched in the same month as Battleborn. Although the two games are somewhat different — and Fahey tells us that Battleborn is pretty good — Overwatch has dominated the market. Battleborn's price has been steadily decreasing since it came out in May, and the game is now selling for just $US20 ($26) at Amazon and some other retailers. The developers have regularly held events and released new content for the game, including free heroes and PVP maps. Gearbox also plans to release story missions and more heroes later this year. The studio will likely offer some sort of reward for current players once Battleborn goes free, although those plans have not yet been finalised, according to the source. Gearbox and 2K have not yet returned requests for comment. 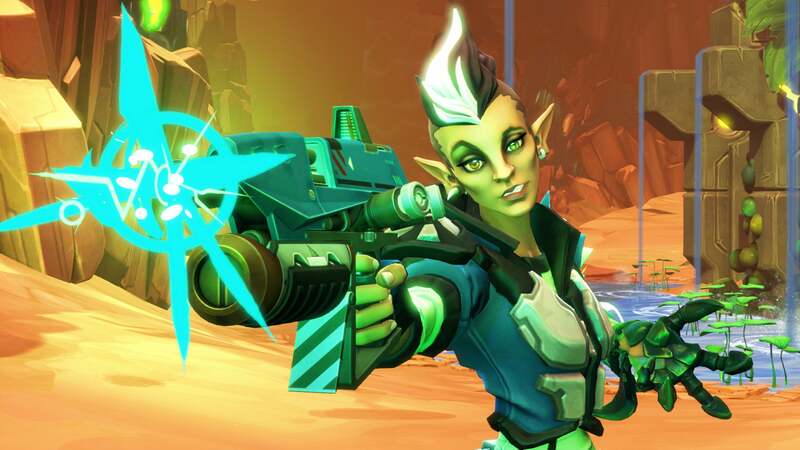 In an earnings call last month, Take-Two Interactive boss Strauss Zelnick acknowledged that Battleborn had flopped and hinted that they'd switch gears. (Take-Two is the parent company of 2K.) "While the game launched to solid reviews, its performance in the market has been below our expectations," Zelnick said. "We think there remains an opportunity to grow the audience for this unique experience over time and 2K will continue to drive engagement and recurrent consumer spending on the title through add-on content and virtual currency." One of the inspirations for this decision, the source said, is the success of 2K's Evolve, which went free-to-play on PC in July and skyrocketed to the top of Steam's charts. After going free, Evolve saw its concurrent player count jump from the hundreds to over 25,000. Gearbox also plans to publish a remastered version of Bulletstorm for current-gen consoles, the source confirmed. News of that remaster leaked out earlier today. Alongside Homeworld and the upcoming Duke Nukem 3D remaster, this is part of a new Gearbox effort to publish games and secure its footing as an independent developer. We have some unannounced plans to do a trial version of the game that would be free and from which retail can be purchased along with DLC. I really should go back and unlock all the heroes before this turns into (more of) an F2P nightmare to unlock them. That would involve playing the game again though. No... I'm cool with being done with this. Only a good thing, this game is fun. Matchmaking has its share of issues but if you can get in with a 5 person team makes it better!! Free trial plans are not firm yet - months away. Expect great continued support and awesome line up of DLC. Obviously these are fake Tweets. An anonymous source would never lie so there is no need to fact check before publishing a story. Trial version... thats wierd, thought the games industry didnt like demos or trial versions cause they dont bring in the sakes numbers. Desperate not to go free2play if they are attemptibg trial versions... so do we just take bets on when the retail component becomes free? I say early February next year. Is this the reckless story? Doesnt matter, Wont save the game. Its done. They made the stupid mistake of trying to compete with overwatch. And look what it resulted in, Their game failing and Overwatch having 10 million + players.